I finally got around in editing this page, lol. 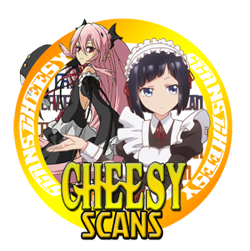 Cheesy Scans was started on Jan 2016 when we wanted to translate Shomin Sample Spin-off. Which happens to be one of the series I quite like. Now there are more than 12 people on the staff group and more than 6 helping us on the series we're scanlating. Q: What kind of projects do you do or pick up? A: Whatever interest the staffs. Mostly me forcing people around though xD. I really have to thank the staff for helping me on some random odd job a lot of times. Q: How can I support Cheesy Scans? A: Well, if you like Shomin Sample or Clockwork Planet or also recently, Working!! series, then feel free to click the donate button. Any amount is always appreciated. P.s I was referring to Working!! Web-Series. Q: Why do you scanlate? A: Why do you do your hobby? I'll try putting the list of our lovely staff and good samaritans whose been helping us later. When I have the time. If I have the time.